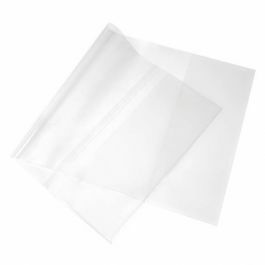 Extend the life of your books and protect them from wear with our crystal clear book sleeves. The BC101Q book cover measures 10 1/4" x 19" and fits books that are 10" tall and up to 19" long. These durable, laminated 2 mil sleeves offer a high clarity cover for retail packaging, gallery collections, or personal favorites. Archive safe. Protect your books from the elements with the help our durable book covers. The BC101Q book cover measures 10 1/4" x 19" and is ideal for 10-inch tall books and up to 19" long (width of front and back cover + width of spine). To accommodate different book thicknesses, the width of this clear cover is adjustable for your convenience. Whether you have a gallery collection, retail books, or personal favorites, this 2 mil poly sleeve offers an impressive presentation, allowing great visibility even when covered. 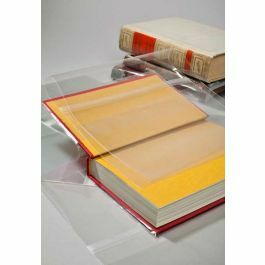 Protect your books from grease, frequent handling, dust, and general exposure. No separate tools are needed for assembly and instructions are included. Outer Dimensions: 10 1/4" x 19"
The primary use of BC101Q is to cover books 10" tall and up to 19" long.